Tom's Postcard for the Planet will be featured in the Guardian tomorrow (26/9/09) in the Review section. To coincide with the launch of their Big Six Months to Save the Planet campaign on Sept 1, the Guardian are putting together a special environmental issue of Review. The whole issue will be devoted to creative responses to the crisis. 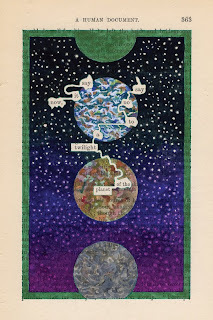 There are new stories and poems promised, and they have invited artists to give a 'Postcard For the Planet' - 6" x 4" with absolutely any message. There will be an auction of the original images, and Tom is planning to contribute a limited edition print of the Humument p363. This is a guaranteed, non-robot hand-crafted comment from me, just to see what happens. Most impressed by the Guardian piece: but, who knew A Human Document was a double elephant folio in size? It was very timely, as I had been recommending the merits of A Humument to a younger colleague just that previous week. She now thinks of me as Mr. Zeitgeist.